The glitter and diamonds were there as always; the gold and silver were shining on throughout. However, this year felt somehow different. From the opening speech, the host, Jimmy Kimmel, wasted no time in mentioning the Hollywood harassment scandals, describing ‘Oscar’ as the most liked man in Hollywood as you can always see where his hands are. for 13 awards, the film won 4, including Best Director for Guillermo Del Toro and Best Picture. It also won Best Production Design and Best Original Score. Other big winners included Frances McDormand winning the Oscar for best actress. Her presentation in ‘Three Billboards Outside Ebbing, Missouri’ beat the likes of Meryl Streep and Margot Robbie to her second Oscar. In her speech, she also chose to mention the importance of women in the film industry and demonstrated the difference that they made. She ended her speech with the phrase ‘inclusion rider’, encouraging gender equality in the film industry. Best Actor went to Gary Oldman for his portrayal of Churchill in ‘Darkest Hour’, another incredible film that details the life of Winston Churchill. They won the Best Makeup and Hairstyling as well. 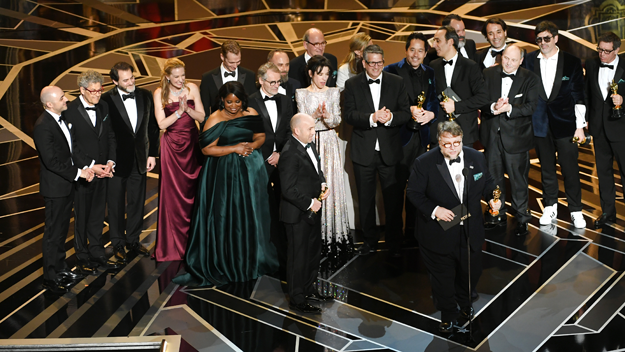 So all in all, it was another exciting ceremony and there were no envelope mix-ups, but had a more serious tone this year and perhaps created a sense that change is coming in the film industry.